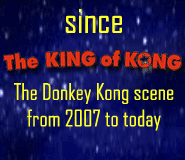 The third Kong Off proved to be the biggest and best yet, with more competitors, much bigger scores, and suspense right up until the last minute. 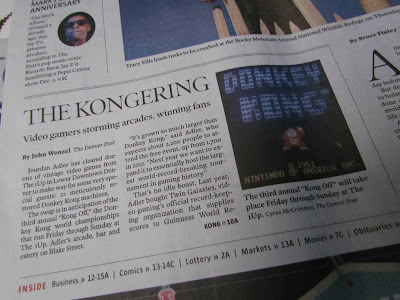 Donkey Kong's finest "brought it" last weekend, putting on a show for which Twin Galaxies and the gaming community should be beaming with pride. Within hours of the first quarter drop on Day 1, former Top 12 competitor Kyle Goewert asserted his place among the big boys—despite his demotion to the Wildcard Division—by turning in the first million-point game of the weekend. With Corey Chambers already having taken an early lead with almost 900,000 points, it was clear that the wildcards had stepped up to give the Top 12 lineup a run for their money. By evening, Goewert had slipped, finding himself in the middle of a "Steve sandwich" as Steve Wiltshire grabbed first place ("I just took the lead. Holy crap, I'm winning!" 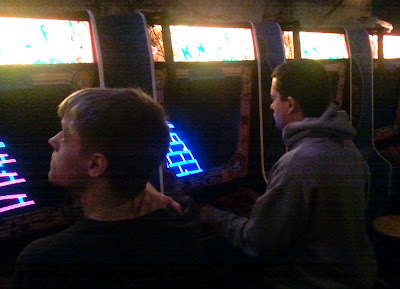 Wiltshire told Facebook), and Steve Wiebe rounded out the top 3 just 800 points shy of Goewert. Before the day was out though, world champion Hank Chien had pushed ahead of the field with 1,056,900, and less than twenty minutes later, Jeff Willms realized everyone's worst nightmare: an enormous 1,096,200. With first place now higher than the all-time personal bests of all but five of the competitors, the field groaned at the imposing task before it. It felt to many that this year's title would go to Willms again, with Billy Mitchell himself declaring "nobody's going to beat that score." In reality, Willms was not actually as safe as he might have seemed. The defending champ even admitted that he had "gotten lucky" and would have to remain so to hold the lead. With such a high mark established at the end of Day 1, it was no longer "anyone's tournament", but by no means was a Willms victory a foregone conclusion. Indeed, Chien and Saglio showed up for Day 2 ready for war, and both pushed deep into games that could have taken first had they reached the kill screen. Saglio had the closest call, reaching 1,033,000 in a game that ended on the last board of Level 20. If Saglio had cleared that board, he would have needed a Level 21 worth about 60,000 points in order to bridge the gap. Considering that Saglio's level averages have routinely exceeded 61,000 in his "1.2" runs (with level maximums often close to 70,000), Willms was likely only minutes away from losing first place if bad luck hadn't gotten in Saglio's way. Meanwhile on Day 2, Dave McCrary (who, like Goewert, was another former Top 12er pushed into the Wildcard Division for this year's installment) had the game of his life, turning in 1,032,000 which earned him first place for the division (a $250 prize), a new personal best, as well as a bump up to 13th place on the all time scoreboard. Steve Wiebe, not content with his standard (but frighteningly consistent) "flat million" with which he has been gracing live events for years, decided to push a little harder on Day 2. He got a hold of a strong run that was on pace to beat Chien for second, as well as push past his (now three year old) personal best, but the game, unfortunately, ended prematurely. Wiebe nonetheless pulled back into third position with 1,048,800. Then, in a game that went into overtime after "last quarter" at 6:00, Kong titan Ross Benziger rose all the way from dead last in the standings to second place (where, incidentally, he also sits on the all-time scoreboard). With the pressure on to prove himself, and despite being "sick as a dog all weekend", Benziger's run was good enough to overtake Chien and the $1,000 second-place prize. 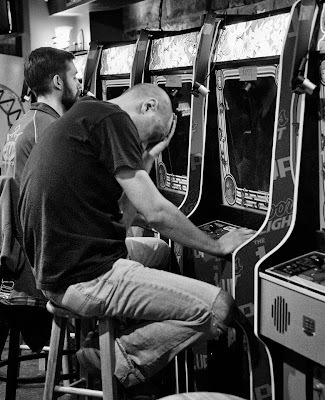 As player after player finished his last run, stepping away from their machines as the live streams went dark, attention turned to Steve Wiltshire—the "last man standing" at the Kong Off 3. As he crossed his earlier score of 1,016,700 with only a few boards left to go, it was clear that there were not enough points left between Wiltshire and the kill screen to win the tournament, but if he could hold on to his spare man and cash it in for extra points on the last barrel board, he had an outside shot at Hank Chien (now in third) and Wiebe was well within striking range. With hundreds of eyes on him, flashes popping, and the crowd on the edge of its seat, Wiltshire's cash-in succeeded. 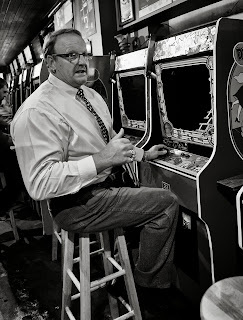 He then pushed through a troublesome final rivet board (one close call in particular eliciting an awed gasp that swept the room), hit the kill screen, and snatched fourth place from Wiebe. The final leaderboard tells the tale of just how serious these competitions are getting. While no new world record was set over the weekend, this was, by far, the toughest Donkey Kong tournament ever held. At the first Kong Off, not a single player broke a million points. 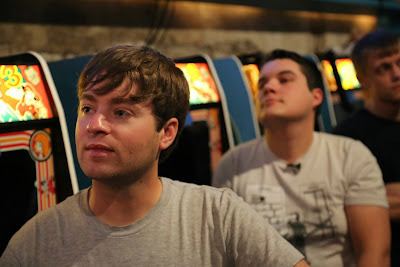 At Kong Off 2, just three players managed to roll the score. This year though, an unprecendented nine competitors were able to breach seven digits, with two (Wiebe and Wiltshire) doing it twice, for a total of eleven million-point games. 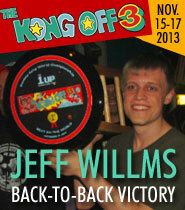 The Kong Off 3 was also a much tighter race than KO2: Willms and Saglio ran away with it in 2012, with Wiebe's third place trailing them by 73,000 points. This year, in contrast, that same gap represented the total span from 1st all the way to 8th. Media interest in the Kong Off 3 was high (and is actually still underway, with two major pieces by Vice Magazine and The Verge expected in the coming weeks). The tournament was front page news in The Denver Post, Denver's ABC, CBS, and Fox affiliates covered the event, Westword featured a photo gallery, the Lincoln Journal-Star interviewed Steve Wiltshire, major technology websites like Ars Technica followed the action (and were kind enough to link to this blog! 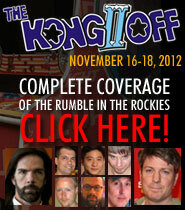 ), and other gaming/sports outlets such as RetroDomination, Polygon, Kitguru, and One World Sports ran stories as well. I was one of the Wildcard Division competitors in this year's tournament, having won my spot during the Online Qualifiers this past summer. Saturday, however, proved to be one of my worst playing-days in a very long time, in terms of luck, energy, focus, mood, and every other factor you can name. I had failed to put in any practice in the lead-up to the tournament, had barely slept the night before, and my head, as they say, "was not in the game." None of this helped. Only the 10 highest-scoring players in the Wildcard Division would move on to Sunday, and it became clear to me, as evening fell, that it wasn't meant to be. 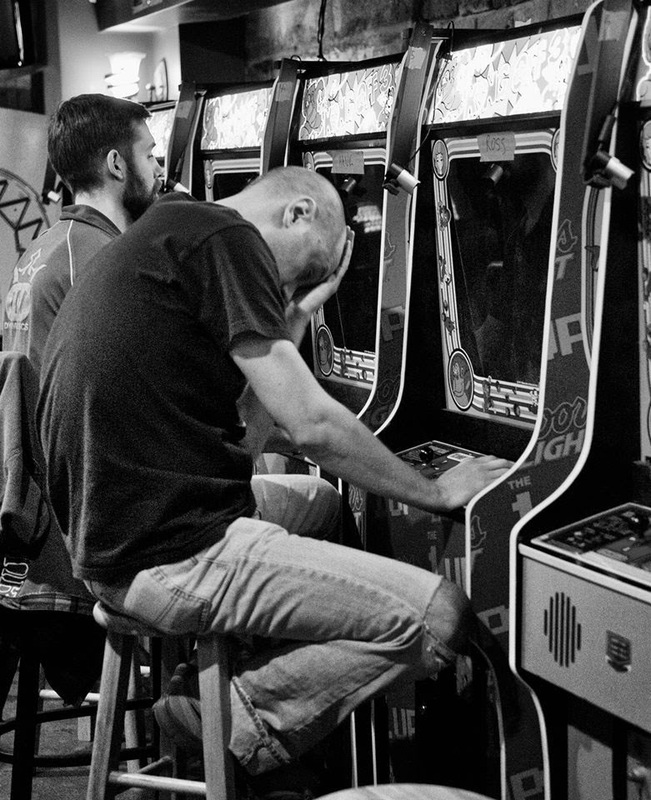 I decided to stop throwing myself and my "F" game at a machine that was refusing to work with me, and instead turn my attention to other things. I quickly made peace with the decision, and it was an easy peace, as I'd actually been feeling for weeks prior that I was going to the event primarily to experience it, with competition being a distant afterthought. I'd cared much more about doing well in the online preliminaries; to prove that I could "make the cut" and earn a place in the big show. I wasn't so concerned about what would happen once I got there. 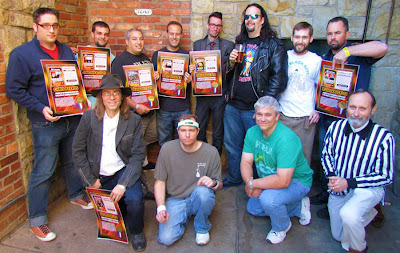 My real priority in Denver was to spend time with this group of friends who, up to this weekend, I'd only known online. I wanted to have Steve Wiebe autograph my King of Kong DVD, to shake Billy Mitchell's hand, to personally thank Walter Day for his part in creating this strange and amazing world. I also wanted time to get into the trenches and follow the action for the blog. In other words, I wanted to do anything and everything but play Donkey Kong! So my elimination on Saturday ended up being the best thing that could have happened, as I got to check all of the "to do"s off my list, and wouldn't have been able to otherwise. I could not care less that I finished lowest in my "online pre-qualifier" division. 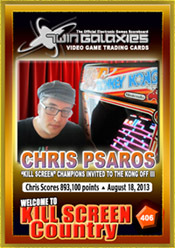 I came back from the event with my own trading card, an award certificate recognizing my "tremendous contributions to the world of competitive arcade gaming", and unanimously positive memories. 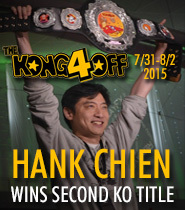 I want to extend my thanks to Richie Knucklez, Jourdan Adler, the crew at The 1up, and my fellow players. It was an exceptionally wonderful weekend, and I have a new appreciation for how much blood and sweat go into an event like this. I'm looking forward to doing it again someday! 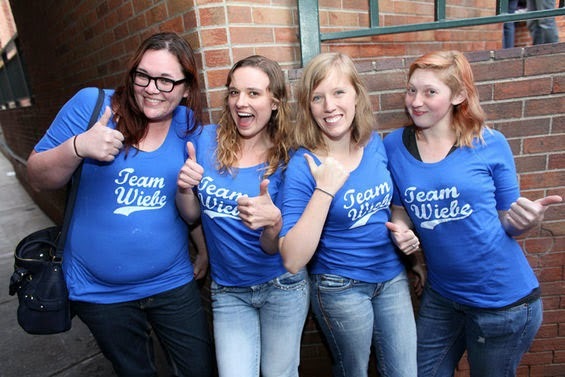 Was Wiebe's wife there to stop the Team Wiebe Girls? ?